Midway Arcade Treasures Extended Play has finally arrived on the PlayStation Portable that features 21 coin-op classics from the days of yesteryear. Even though this compilation features some of the best known games of the 20th century, I must admit that this was an extremely difficult title to review, considering how far gaming has come in 20 years and what was once considered the pinnacle of gaming can now be found on mobile phones and the like. Not to mention that many childhood memories may now be crushed because of lacklustre graphics, simplistic gameplay and limited sound effects. Fortunately the creators of this modern release have not rested on their laurels and have added some extra features into this version that is perfect for the world of mobile console gaming. 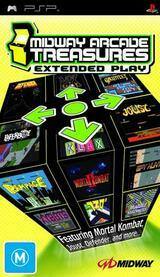 That's right, Midway Arcade Treasures Extended Play now contains wireless multiplayer for the Klax, Joust, Marble Madness, Toobin, Rampage, Gauntlet, Rampart, Wizard of Wor, Xybots, Championship Sprint, Arch Rivals, Cyberball 2072, Xenophobe, Mortal Kombat, Mortal Kombat 2, Mortal Kombat 3. Although most of these titles support an extra player via wireless, Gauntlet actually supports 4-players via multiplayer wireless for some truly interesting and extremely entertaining gameplay. Some of the classics featured on this compilation include Defender, that had the gamer transforming into a space fighter pilot who had to defend the planet from alien invaders and what made matters worse is that these aliens kidnapped humans. The gameplay, although simplistic was quite difficult as the levels progressed and as more and more humans were being kidnapped, you had to increase the ante of your gaming skills that meant attacking aliens, rescuing falling humans and making sure that you didn't hit anything as you flied through the battlefield. Unfortunately one wrong move or one enemy shot and you were history. A classic game! 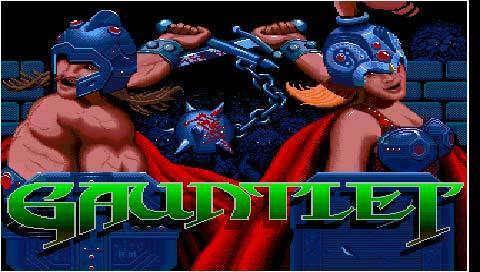 Gauntlet was probably my favorite game of this entire compilation but virtually had thousands upon thousands of levels where the gamer (1 to 4 players) was transformed into Thor the warrior, Thyra the Valkyrie, Merlin the Wizard or Quester the Elf. You basically had to work as a team to destroy as many monsters as you can before they engulfed the entire dungeon. This was done through upgrades, weapons, potions and of course that famous character called Death who really put a spanner in the works when he was accidentally released. The best part of Gauntlet is that you can play wirelessly with other PSP owners for some great old school fun of up to 4-players. The treasures compilation also features all three Mortal Kombat games that were the precursor to many fighting games of today that let the gamer choose from a variety of different fighters and perform some of the most deadly and horrendous martial arm maneuvers. Needlessly to say, the graphics for all three games are impressive with extraordinary sound effects. Outstanding! Other games such as Paperboy, Spy Hunter and the Wizard of Wor are classic titles that have not been kind in the ages and are rather bland, both graphically and in gameplay. Needless to say, this compilation is a hit and miss affair when compared to games of today that not everyone will be able to appreciate the nostalgic view of gaming history. 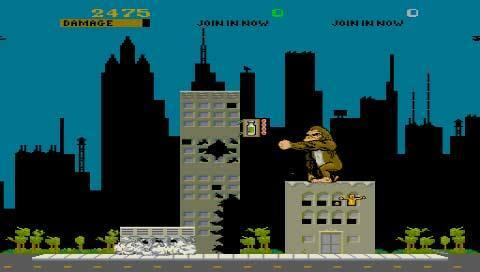 Other games such as Rampage or Championship Sprint will make you appreciate how good these titles were in their time that have spawned many remakes and copies of these entertaining classics. The control system of Midway Arcade Treasures Extended Play is brilliant and maximizes the PSP control system perfectly with the analog stick (or d-pad) used to control your characters with the main button being used is the X button for most titles, apart from Mortal Kombat. Graphically, all the games feature sprites (or pixels) with limited colors and simplistic animation that actually do the job quite well. Although the Mortal Kombat series of this compilation easily have the best graphics on this disc. In its days, voice acting on games was rather rare but titles such as Gauntlet and Mortal Kombat contain some limited voice acting that was an amazing feat in its day and match that with a variety of sound effects from the 80's such as beeps and bops and you have a true trip down memory lane. In conclusion, Midway Arcade Treasures Extended Play at $49.95 is a great value pack that is recommended to the more refined gamer who wishes to play games of yesteryear but be warned, some of the titles may destroy existing memories of an easier time. Perfect for a long trip or for those kids who have everything. A great collection!